Hello all you lovely guys out there! And oh my we've got summer holidays in 3 weeks - Israel and Asia are calling! Caaaann't waaiiiit! We'll talk about that in more detail veeery soon! We hope you all enjoy this post and you are rocking your weekend! Jesteś bardzo ładna, ślicznie tutaj u Ciebie! :) Pozdrawiam! Jeśli masz ochotę to gorąco zapraszam! Girls you both looks beautiful! love the sweatshirt printed with roses! I love that place!! And your outfits are great. Supertolle Outfits! Ihr zwei seid wirklich Zucker!! these looks are great! you guys really know how to pull things together:) thank for the comment on my blog btw, i think i may eventually do a makeup post, since i get so many request for how i do my makeup! i'll be following you now, be sure to follow me too so we can keep in touch! You boh look adorable! Always so beautiful and stylish! You both look so lovely and are so pretty! Would love if you could check out my blog as I'm fairly new to this blogging business haha! Thanks for this peek into Zurich. Wow, both that outfits are soo nice. Your plans are sounding really good! 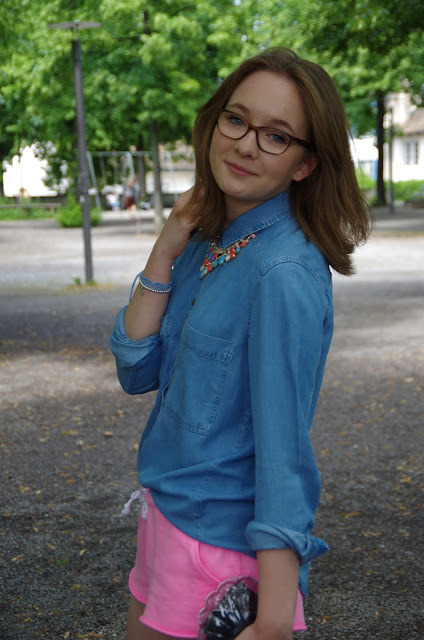 And your outfits are so great - I´m absolutely in love with this sweater with the roses and the pink pants with the denim shirt <3 I´m such a great fan of pink! Both your looks are simply perfect! love the attire! Do come up with some summer trends too! Girls!! I love your outfits! great shorts! wow girls you look both great! i especially love the pink shorts and that adorable roses jumper! i´m following now via GFC and Bloglovin! Oh I love the flower sweater and the colorful necklace! You're both so beautiful and stylish! where is the black bag form? I simply loooove the dark blue flower sweater!!!!! Where did you buy it?